With this product you can accumulate up to 120 Glitter Points. Gives volume and firmness to the breasts. 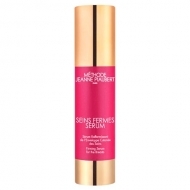 DESCRIPTION: Décolleté 3D Repulpeur de Seins from Jeanne Piaubert is a sinus treatment ultra-concentrated volume effect. It promotes the entry of fats into the adipocyte by stimulating lipoprotein lipase (LPL). It has lipogenesis (storage of fats) and adipogenesis (increase of adipose tissue). Stress and anti-stretch marks thanks to the extract of Cucurbita Pepo that favours the elasticity of the skin of the breasts. It allows you to fix the fats from the diet at the height of the breasts. With a recovered, more generous tonicity, the breasts gain volume, roundness and firmness. Apply to the breasts 2 to 3 times a day, right after meals, for 4 weeks.